Giveaway: BUYBUYGO Sleep Foam Earplugs | FreebieOrBust Freebies! Let lady luck decide if you deserve to win big! Our daily sweepstakes giveaways change every 24-hours, and we award prizes to thousands of our registered members. 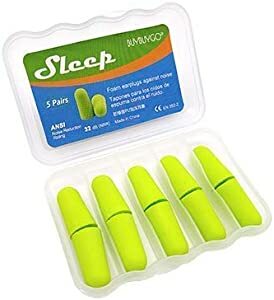 BUYBUYGO Sleep Foam Earplugs, 5 Pairs Soft Ultra Comfortable Noise Reduciton Ear Plugs, Hearing Protection for Sleeping, Snoring, Travel, Working and Shooting, NRR 32 dB.. Here are your odds: 1:300. You can win 1 of the 2 prizes available. Sweepstakes hosted by Amazon and Very Sad for Two Star. Good luck! Our team uploads hundreds of new sweepstakes deals every week, giving you more opportunities to win!